Tumours in and around the brain can certainly cause headaches, but fortunately they are fairly rare in occurrence. Depending on the type of tumour and the location, symptoms will vary. 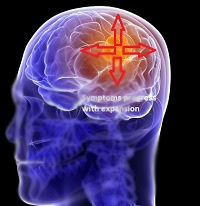 Most often there is a slow progressive increase in pressure inside the skull (as the tumour grows), so symptoms are usually also slow and progressive and may involve a steady loss of control in some of the nerves around the head, face and even the whole body. Personality changes may also occur if the front of the brain is involved; and sometimes even visual, hearing and ‘smell’ hallucinations may occur. Headaches may also occur and are usually persistent, dull and aching in quality; and may not even be that severe. Coughing and straining to go to the toilet, may further aggravate the headache. Once again this demonstrates the importance of obtaining an accurate diagnosis, usually by simple, non-invasive medical procedures. The outlook for a patient with this type of problem will be greatly influenced by the type of tumour, it’s location, and how early it is diagnosed; so if in doubt get it checked out. Usually in cases such as this, a thorough evaluation by a Neurologist would ensure an accurate diagnosis, and hopefully- a good outcome.